Introduction: The perception of students considering their educational environment is a useful source to modify or to improve the quality of education. Whereas the education is a dynamic process, researches about this topic are important to improve education methods and strategies. Equally essential is to know opinion of the students about teachers and educational environment. Aim: The aim of this study is to assess students' perceptions of educational environment using Dundee ready education environment measure (DREEM) among four different health science courses. Materials and Methods: A cross-sectional survey design was conducted on 398 students enrolled in undergraduate health science programs offered at a multispecialty university in Haryana, whose courses consisted of traditional classes and clinical fieldwork. This comprised of students from bachelor degrees in Dental Sciences, Physiotherapy, Nursing, and Allied health sciences. The survey was conducted using a standardized self-report questionnaire DREEM, which is 50-item, close-ended, and scored on 5-point Likert scale. Results: The mean total DREEM score was 77.2 ± 13.07, which according to the interpretation guide was seen to be more positive than negative. More positive results were seen among students of dental sciences (76.7 ± 12.8) and physiotheray (78.06 ± 13.1). Statistical significant difference (P ≤ 0.05) was seen among all the courses in each subscale. Students' perception of teachers and students' self-perception showed statistically nonsignificant results when compared between gender. Conclusion: Students rated their learning environment as positive. This suggests a student-centered approach from the university and may lead to positive outcomes for the students. Educational environment is difficult to be defined in a short, easy, and concise way because of the complexity of medical educational environment. Genn and Harden explained that “this environment comprises a multitude of settings which includes lecture rooms, tutorial classes, laboratory and practical classes, hospital wards, outpatient clinics, and general practice.” In addition to this, there are the “socializing agents which appear to have considerable power to influence the nature of the settings” including other students, lecturers, teachers from different departments, clinicians, advisors, educators, administrators, paramedics in addition to the patients. The medical education environment is increasingly becoming the focus of research globally. The main mission of universities is to train qualified personnel needed by the community, promote and enhance knowledge, and promote research and provide an appropriate context for developing countries. It is commonly understood that educational environments are an important factor for efficient learning. A school's educational environment encompasses student-teacher relationships, teaching and learning strategies, students' psychosocial and emotional needs, as well as the physical structures and facilities provided of the institution. A productive and conducive learning environment is provided if the higher education institution can provide all of these. It is generally recognized that the learning environment affects students' competencies, academic achievement, and success., It is therefore not surprising that the educational environment has been identified as one of the targets for the evaluation of medical education programs by the World Federation for Medical Education. There is a proven connection between the environment, curriculum, and the outcomes of students' achievement, satisfaction, and success. Innovations in curricula and increasing diversity of the student population have led to increasing recognition of both a desire and need to evaluate the educational environment. A cornerstone of any academic program and university school, in general, is the fundamental right of students to freely express their views and play an active role in the decision-making process. They must feel part of the process rather than alienated from strategizing their own education. The input of the students, the stakeholders, has been overlooked far too much. Thus, the significance of students providing feedback for curriculum planning and change is indisputable. Therefore, the aim of this study was to evaluate, by way of student perceptions recorded on the Dundee ready education environment measure (DREEM) inventory, the overall education environment within four health science courses that employ a balance of traditional classroom-based teaching and clinical fieldwork, as well as specific aspects of this learning environment. The second aim of this study was to investigate whether the education environment or aspects of it are perceived more or less favorably for students of different health professions, year levels, educational backgrounds, or gender. A cross-sectional survey design was used with a paper-based questionnaire with a standardized self-report scale. Information regarding the student's age, gender, year of study, and course was collected using a short demographic questionnaire. Participants included 398 students enrolled in four different medical science courses at a multispecialty university in Gurgaon, Haryana. The four courses included in the study were Dental Sciences, Physiotherapy, Nursing, and Allied Health Sciences. Students from their 1st year of course were excluded from the study and convenience sampling was used to source participants from the university. Students' social self-perceptions (SSP) (7 items; minimum 7–maximum 35). Each of the 50 statements is scored on a five-point scale, with the following labels: “Strongly agree,” “agree,” “not sure,” “disagree,” and “strongly disagree;” a lesser score reflects stronger perceptions to that particular item and subscale. Items are in the form of statements relating to the respondent's course environment (e.g., “I am encouraged to participate in class”), which are rated as, 0 = strongly agree and 4 = strongly disagree. Nine items are worded negatively (e.g., “cheating is a problem in this school”) and are reversed scored by the researcher before tallying. Item scores count toward an overall environment score as well as one of the five subscales or domains (abbreviations and maximum subscale scores are in parenthesis): (SPL, 48), (SPT, 44), (SAP, 32), (SPA, 48), and (SSP, 28). The overall DREEM score is out of 200. Guide to interpreting the overall scores: 0–50 (0%–25%) = excellent; 51–100 (25.1%–50%) = more positive than negative; 101–150 (50.1%–75%) = plenty of problems; and 151–200 (75.1%–100%) = poor. The DREEM has been shown to be valid and reliable in several contexts with medical and healthcare professions., High internal consistency has been reported independently by Cronbach's alpha levels of 0.92. This research was conducted during 2017, between August and October. At the end of a class (lecture or practical workshop), one of the researchers facilitated the process by providing participants with an explanatory statement outlining the study and explaining that all data collected is anonymous. The DREEM and demographic questionnaires were distributed, and consent to participate in this study was assumed if the student completed and returned the questionnaire. Students were allowed to leave if they did not wish to participate. Students were given 10–15 min to complete the survey by marking their answers on the survey instrument. No follow-ups were undertaken. Ethical approval was obtained before study from the ethical review board of the institute. DREEM scores and demographic data were entered into and analyzed using Statistical Package for the Social Sciences Version 21 developed by IBM (Chicago). 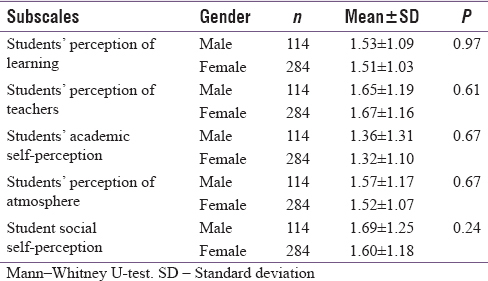 Nonparametric analysis was done using Mann–Whitney U-test and Kruskal–Wallis test. P ≤ 0.05 was considered statistically significant. Among the total 398 participants, 114 (28.6%) were male, and 284 (71.4%) were female. Subjects comprised 166 (41.7%) from the faculty of dental sciences, 81 (20.4%) from the faculty of nursing, 83 (20.9%) and 68 (17.1%) from the faculty of physiotherapy and faculty of allied health sciences, respectively [Table 1]. Among the total 398 participants, 369 (92.5%) were academic achievers and 29 (7.3%) were underachievers. Comparison between the achievers and underachievers among four courses is presented in [Figure 1]. Mean values for SAP among achievers was 1.32 ± 1.16 and for underachievers was 1.43 ± 1.18 (P = 0.70) whereas for SPL among achievers and underachievers, mean value was 1.51 ± 1.02 and 1.59 ± 1.02, respectively, (P = 0.72). Out of five, the above-mentioned two domains had the best score. 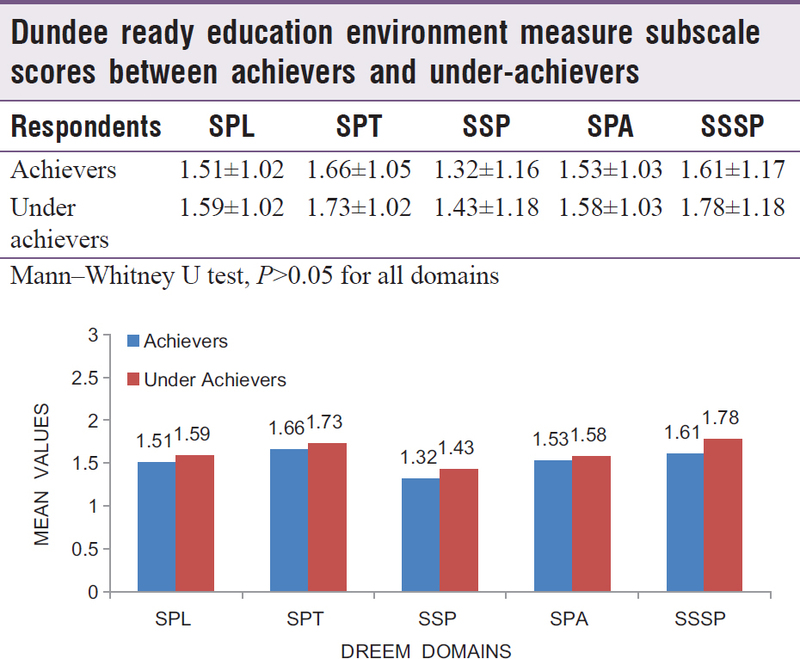 Difference between achievers and underachievers under all the domains of DREEM Questionnaire came out to be nonsignificant. The mean DREEM score of the study population was77.2 ± 13.07, which according to the interpretation guide was seen to be more positive than negative. Statistically significant difference was observed between different courses among the DREEM subscales (P ≤ 0.05) [Table 2]. Students' perception of teachers and students' self-perception showed statistically nonsignificant results when compared between genders [Table 3]. The standing committee on postgraduate medical education states that a working environment that is conducive to learning is critically important to successful training., Learning depends on engaging the learner, which is determined by motivation and perception of relevance. These, in turn, can be affected by learners' previous experiences and preferred learning styles and by the context and environment in which the learning is taking place. Therefore, the educational environment plays a crucial role in the learning process. This study aimed to evaluate the education environment as perceived by students of a range of health science courses at a major university in Haryana. It also aimed to investigate whether the education environment or aspects of it are perceived more or less favorably among students from different health professions, educational backgrounds, or gender. When the guide of Roff and McAleer was used to interpret the mean score, the overall perception (total score = 77) was found to be more positive than negative in our study. A similar study done in Sri Lanka with medical students has reported lower perception. Literature review on studies conducted in various dental schools by Mahrous et al., Kossioni et al., and Idon et al. attributed a more student-centered curriculum showing a more positive than negative environment. In our study, female health science students indicated a more positive perception of their environment than did males. This is consistent with past studies involving students from the UK, and opposite trend was shown to be in the study done by Roff and Jiffry et al. Interpretation of five subscale mean scores revealed perceptions toward the positive side. Lower mean scores in subscale of SAP reflect a positive response to student-centered curriculum emphasizing long-term learning and problem-solving skills. On the contrary, the highest score was observed in SPT subscale. The tedious and tiring nature of the course may reflect many areas of weakness which need further exploration and rectification. The mean scores for SPL reflects a more positive perception (1.51 ± 1.03). Similar interpretations were observed in studies conducted in India and Nigeria However, higher scores were obtained in a study conducted in Saudi Arabia. The mean scores for students' perception of teachers reflect that the teachers' way of teaching is moving in the right direction (1.67 ± 1.17). Similar scores were obtained in studies conducted in India and Nigeria On exploring the items in the subscale in our study, it was seen that 2 items had a mean score >2 reflecting problematic areas. These areas were identified as the teachers are authoritarian, and the teachers get angry in class. Due to such methods, the students felt that they were unable to ask questions in fear of being ridiculed. It is important that the teachers realize that respect to students is important to the learning process. On the brighter side of these negative virtue of teachers, presented a knowledgeable picture of teachers in their minds and they would come well prepared for the class. SAP had higher mean values; hence, it reflects that the students have a negative perception. Similar study was done by Doshi et al., which showed a positive perception among students. In our study, the mean scores of all five subscales were higher for academic achievers as compared to the underachievers. Similar study was conducted by Jnaneswar et al. comparing the perceptions between achievers and underachievers. In line with our study, similar scores were reported in a medical school in India. The higher scores for underachievers was mainly due to less satisfaction with their educational environment. On the other hand, a study conducted in India reported higher mean scores for all the subscales among underachievers. Our study had several limitations. First, the number of participants varied considerably between courses and year levels. Second, the sampling method applied was the convenience sampling that may lead to sampling bias and may compromise the results obtained, and finally, all the eight medical health science courses running in the university should be included in further studies to have an idea about the uniformity in the educational delivery despite students being from different courses. 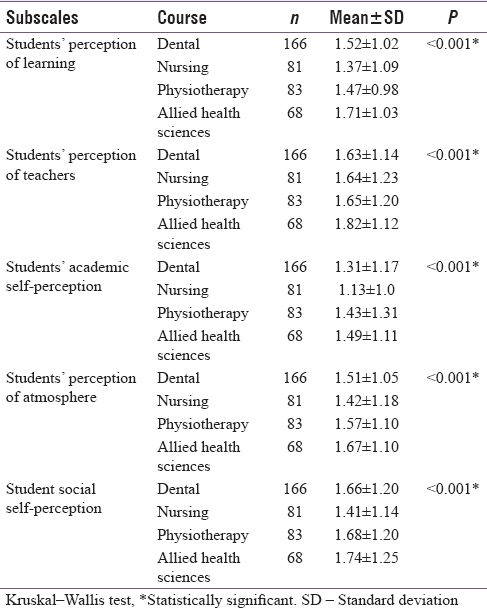 In our study, more positive results were seen among the faculty of dental sciences, followed by physiotherapy suggesting that students enrolled in health science programs hold positive perceptions toward their course environment. This suggests a student-centered approach from the university and may lead to positive outcomes for the students. There is a close link between the positive perceptions of the environment and learning outcomes of the student. The DREEM inventory may thus be a useful tool for course/program organizers to ensure and maintain high-quality educational environments and recheck students' standpoint. Genn JM, Harden RM. What is medical education here really like? Suggestions for action research studies of climates of medical education environments. Med Teach 1986;8:111-24. Al-Naggar RA, Abdulghani M, Osman MT, Al-Kubaisy W, Daher AM, Nor Aripin KN, et al. The Malaysia DREEM: Perceptions of medical students about the learning environment in a medical school in Malaysia. Adv Med Educ Pract 2014;5:177-84. Harden RM. The learning environment and the curriculum. Med Teach 2001;23:335-6. Genn JM. AMEE medical education guide no 23 (Part 2): Curriculum, environment, climate, quality and change in medical education-a unifying perspective. Med Teach 2001;23:445-54. Roff S, McAleer S. What is educational climate? Med Teach 2001;23:333-4.
International standards in medical education: Assessment and accreditation of medical schools' – Educational programmes. A WFME position paper. The executive council, the world federation for medical education. Med Educ 1998;32:549-58. Bloom BS. Stability and Change in Human Characteristics. New York, USA: John Wiley and Sons; 1964. p. 435. Cardall WR, Rowan RC, Bay C. Dental education from the students'perspective: Curriculum and climate. J Dent Educ 2008;72:6009. Vaughan B, Carter A, Macfarlane C, Morrison T. The DREEM, part 1: Measurement of the educational environment in an osteopathy teaching program. BMC Med Educ 2014;14:99. Sobral DT. Medical students' self-appraisal of first-year learning outcomes: Use of the course valuing inventory. Med Teach 2004;26:234-8. Roff S, McAleer S, Harden RM, Al-Qahtani M, Ahmed AU, Deza H, Groenen G, et al. Development and validation of the Dundee ready education environment measure (DREEM). Med Teach 1997;19:295-9. Roff S. The Dundee ready educational environment measure (DREEM) – A generic instrument for measuring students' perceptions of undergraduate health professions curricula. Med Teach 2005;27:322-5. Miles S, Swift L, Leinster SJ. The Dundee ready education environment measure (DREEM): A review of its adoption and use. Med Teach 2012;34:e620-34. Till H. Identifying the perceived weaknesses of a new curriculum by means of the Dundee ready education environment measure (DREEM) inventory. Med Teach 2004;26:39-45. Roff S, McAleer S, Ifere OS, Bhattacharya S. A global diagnostic tool for measuring educational environment: Comparing Nigeria and Nepal. Med Teach 2001;23:378-82. Brown T, Williams B, Lynch M. The Australian DREEM: Evaluating student perceptions of academic learning environments within eight health science courses. Int J Med Educ 2011;2:94-101. Standing Committee on Postgraduate Medical Education. Improving the Experience: Good Practice in SHO Training. London: Standing Committee on Postgraduate Medical Education; 1991. Hutchinson L. ABC of learning and teaching: Educational environment. BMJ 2003;326:810-12. Mahrous M, Shorman HA, Ahmad MS. Assessment of the educational environment in a newly established dental college. J Educ Ethics Dent 2013;3:6-13. Kossioni AE, Varela R, Ekonomu I, Lyrakos G, Dimoliatis ID. Students' perceptions of the educational environment in a Greek dental school, as measured by DREEM. Eur J Dent Educ 2012;16:e73-8. Idon PI, Suleiman IK, Olasoji HO. Students' perceptions of the educational environment in a new dental school in Northern Nigeria. J Educ Pract 2015;6:139-47. Zamzuri AT, Ali AN, Roff S, McAleer S. Students' perceptions of the educational environment at dental training college, Malaysia. Malays Dent J 2004;25:15-26. Varma R, Tiyagi E, Gupta JK. Determining the quality of educational climate across multiple undergraduate teaching sites using the DREEM inventory. BMC Med Educ 2005;5:8. Entwistle NJ, Ramsden P. Understanding Student Learning. London: Croom Helm; 1983. Till H. Climate studies: Can students' perceptions of the ideal educational environment be of use for institutional planning and resource utilization? Med Teach 2005;27:332-7. Jiffry MT, McAleer S, Fernando S, Marasinghe RB. Using the DREEM questionnaire to gather baseline information on an evolving medical school in Sri Lanka. Med Teach 2005;27:348-52. Shehnaz SI, Sreedharan J. Students' perceptions of educational environment in a medical school experiencing curricular transition in United Arab Emirates. Med Teach 2011;33:e37-42. Doshi D, Reddy BS, Karunakar P, Deshpande K. Evaluating student's perceptions of the learning environment in an Indian dental school. J Clin Diagn Res 2014;8:ZC39-42. Jnaneswar A, Suresan V, Jha K, Das D, Subramaniam GB, Kumar G. Students' perceptions of the educational environment measured using the Dundee Ready Education Environment Measure inventory in a dental school of Bhubaneswar city, Odisha. J Indian Assoc Public Health Dent 2016;14:182-7. Abraham RR, Ramnarayan K, Pallath V, Torke S, Madhavan M, Roff S. Perceptions of academic achievers and under-achievers regarding learning environment of Melaka Manipal Medical College (Manipal campus), Manipal, India, using the DREEM inventory. South East Asian J Med Educ 2008;1:18-24.